Model T Ford Forum: Location for 6 terminal wood firewall terminal block 1920? Model T Ford Forum: Forum 2013: Location for 6 terminal wood firewall terminal block 1920? Can anyone give some help,dimensions to where the 6 terminal electrical block is located on a 1920 wood firewall so I can put it on!Thanks! 6 terminal would be incorrect for 1920. 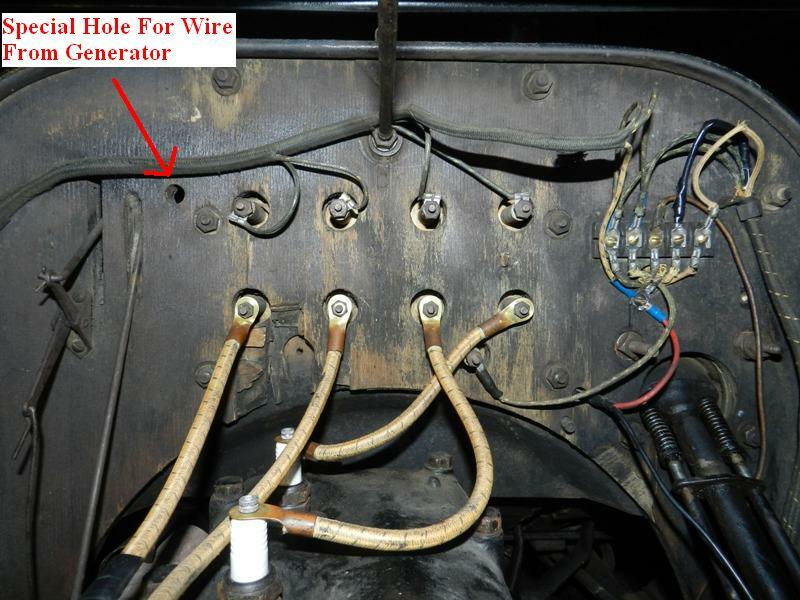 Up to at least Aug or Sept of 1921 and maybe longer, the wire for the generator did not go to the terminal block. It ran to the amp meter with out stopping at the terminal block. This is the firewall on my 1921 coupe when I got it. 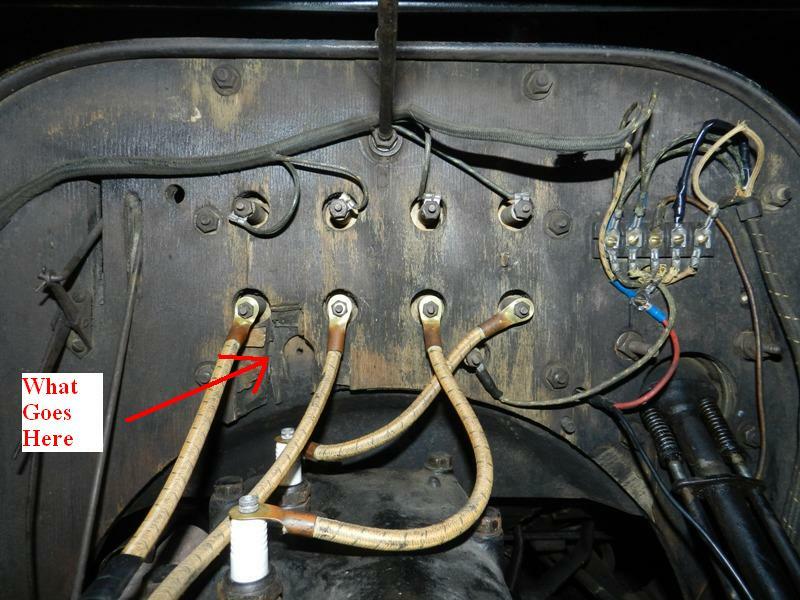 Thanks Mark for the picture!It seeems a while back Dan Treace posted some Ford F.A System 1919-20 wiring diagrams and one had 5 terminal strip and the other a 6 terminal.I think the repro harnesses have the wire in it to go to the strip.Anyone know when these changed?My engine # was built April 4 1920.Just trying to get it together right the first time if I can.And how about location of mounting the choke bellcrank to the firewall?I also need to know where it should be mounted.I have not been having good luck finding good pictures of original firewalls for wiring clips and locations and things like that.Thanks!! I no longer have the body but these should give a good idea where it goes. Interesting subject. Your car had a separate wire to the ampgauge. In addition, you might try looking at some old Victor Page Model T books. There are some really good photos in those books that show what you are looking for. I've also seen pictures, and also one beat up terminal block used in 1919 that has rounded ends on it. 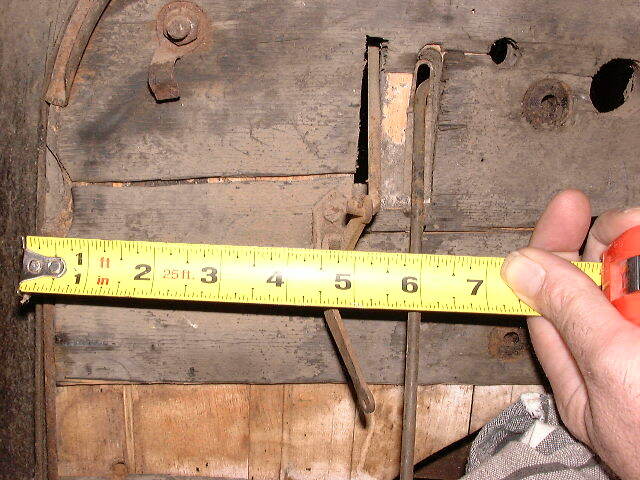 The 1920 part book shows 4 different length wires for the cut out to amp meter in the closed cars. None listed for the open cars but this could be because not many open cars were getting starters yet at the factory. It list the fire wall mounted and generator mounted cut out. There is only one commutator wire listed for starter type and a few other sundry wires. There is no indication of how may terminals on the block. I would like to thank Hap Tucker first off for supplying me with Ford firewall prints that really helped getting things correct,like the notches in the sides fir the hood hinge and the notch that is at the bottom curve for the horn for clearance.I now have mounted the correct 5 terminal block,added the appropriate notches that are not in the reproduction firewalls,and last week got the correct 1919-20 wiring harnesses that were made from originals from Rhode Island Wiring Services.These are beautiful copies for us 2 year only starter cars with the separate wire going to the ammeter.They are exactly color coded to the early Ford diagrams.So if you need these particular harnesses that none of the vendors have,here you are! !Now my firewall is correct and complete,finally!I again would like to thank everyone who gave help with information and pictures,you are the best!Have a great Labor Day all!! Related threads: �Wood firewall pictures needed for 1920 reference please� at http://www.mtfca.com/discus/messages/331880/372657.html which has some good photos and additional details. Long term, I would like to see additional details such as this compiled and made available for different Model T parts and assemblies. Gail Rodda has done that for many items in his �Parts Identification Guides� and of course Bruce did that for many items in his Encyclopedia. Not so some one can make negative comments about someone else�s T, but rather to help anyone who wants to make their T more accurate or in many cases just wants to get their T back on the road, they can find the help they need. So for approximately 4 months the directions for where to drill the holes for the Bendix cover to be mounted were rotated 30 degrees and then later they went back to the previous location. It is extremely unlikely that all of the branches would have changed at the same time. Not to mention some transmission covers with the offset holes may have been shipped to some branches that also assembled engines. And those transmission covers would have been installed on a completed engine assembly at a later date and then installed in a car. All that to say � we do not have one those �black boxes� that are installed on the airliners that record all types of information about what the aircraft does or doesn�t do installed on any of our Fords. But Bruce, the MTFCI Judging Guidelines 6th Edition, and others have provided some excellent guidelines for anyone who desire to use them. I look forward to working with and supporting others in gathering and compiling additional data over the years to come. Thank you all for your support to our clubs, our hobbies, and to helping improve the information we have about the cars and trucks. hole for the cutout wire to left of coil box insulators but didn't use. I installed standard loom with the original 5 terminal block and bolted the ring connectors together separately that would have used the 6th terminal. Wish I had known about Rhode Island wiring at the time. Thanks for the reply Hap,I look forward to hearing from you!Here is another question I still have concerning electrical equipment on the 1919-20 cars,when approximately would Ford have stopped using the ignition switches with the nickel plated cast lever and started using the stamped steel one?I have trouble knowing this as I have a stamped steel lever type and would like to know If I am correct or not for my car.I guess same goes for the hot air pipe for the carburetor also.Burning questions that keep us awake at night!! 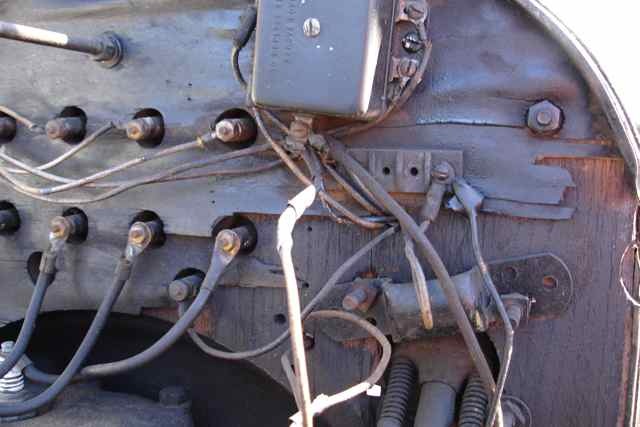 Here is some extra confirmation for the 5 terminal wiring junction block and wiring and possible proof that is was on cars slightly passed September of 1921. 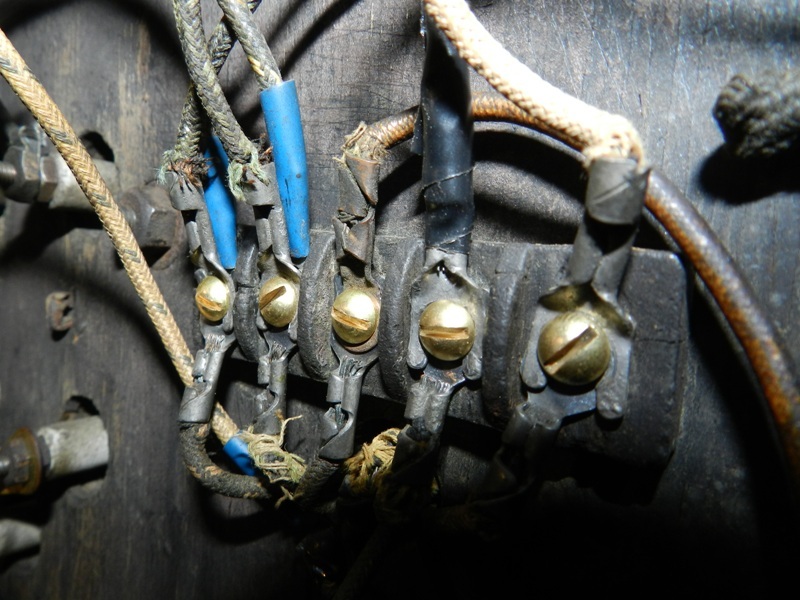 "Up to at least Aug or Sept of 1921 and maybe longer, the wire for the generator did not go to the terminal block. It ran to the amp meter with out stopping at the terminal block. 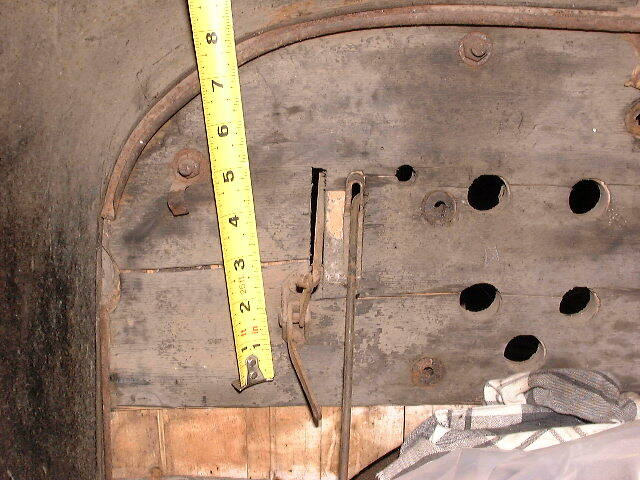 This is the firewall on my 1921 coupe when I got it." These are the specs for my car that so far appears to be mostly original. 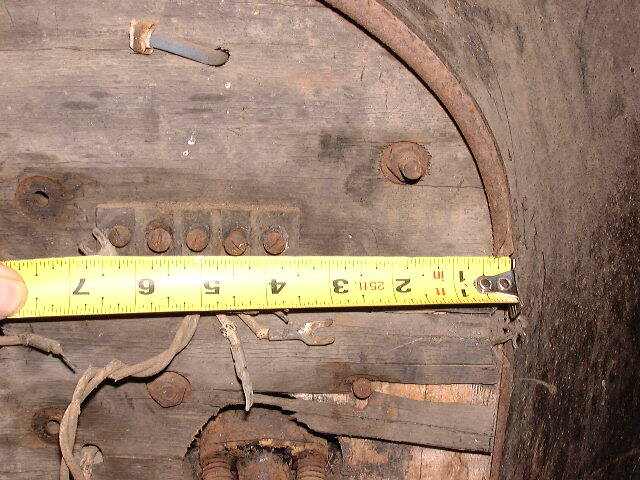 That puts this 5 terminal block and wooden Firewall with the extra hole near the coil box, as late as November 09 1921. The Block is not wood but a Fordite like Plastic and it has rounded junction dividers. You can see in the pictures that at some point someone bought a new wire harness and it was the wrong one. 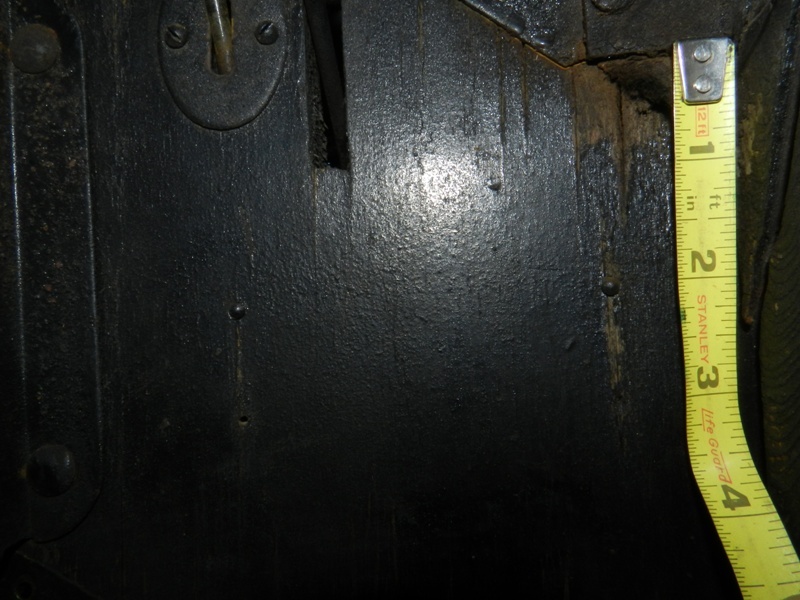 The wrong harness is a little to short to make the Ammeter connection correctly. It barely makes its and needs to be stretched some to get there. Not Ideal but works at the moment. The only place I know to buy the correct wire harness for this firewall and car(as mentioned previously) is Rhode Island Wiring Services. There is some confusion on there site for the correct year you need. The correct 5 wire harness you will need is their 1919-1920 but just know if you have this setup on a 1921 or early 1922 like mine and many others you still need the the one they have listed as 1919-1920. I don't mean to clutter up this thread with something totally useless, but I just have to say that this particular thread and this bunch of great guys are a wonderful example of what this club and especially what this terrific forum are all about! Note that on Adam's old firewall the outer veneer layer runs up and down and not sideways. Hey Ray, good eye there! The veneer does run up and down, is that not correct? I can see from some of the other photos above that the veneer seems to go sideways. I never would have caught that. Also what goes here in this hole. Magneto connection. Apparently the mag is not hooked up. Or is your mag hooked up through a later switch on the dash? Richard I think you are talking about the other side. This hole looks the same as the Mag Post hole but is on the opposite side. You can see the Mag post in the picture on the right side and its hooked up. You can see this mystery hole on firewalls the other two fellas posted as well. I am almost sure my Mag is hooked up and working. Its not great but it runs on Mag. Its another work in progress. A side note but it looks to me like the Rip Van Winkel Firewall also has the Vertical Veneer not Horizontal. Its hard to tell though. That is for your battery. There should be a coil box post there. Ok, that makes sense for the older cars like the 1917 Model T in the old picture. 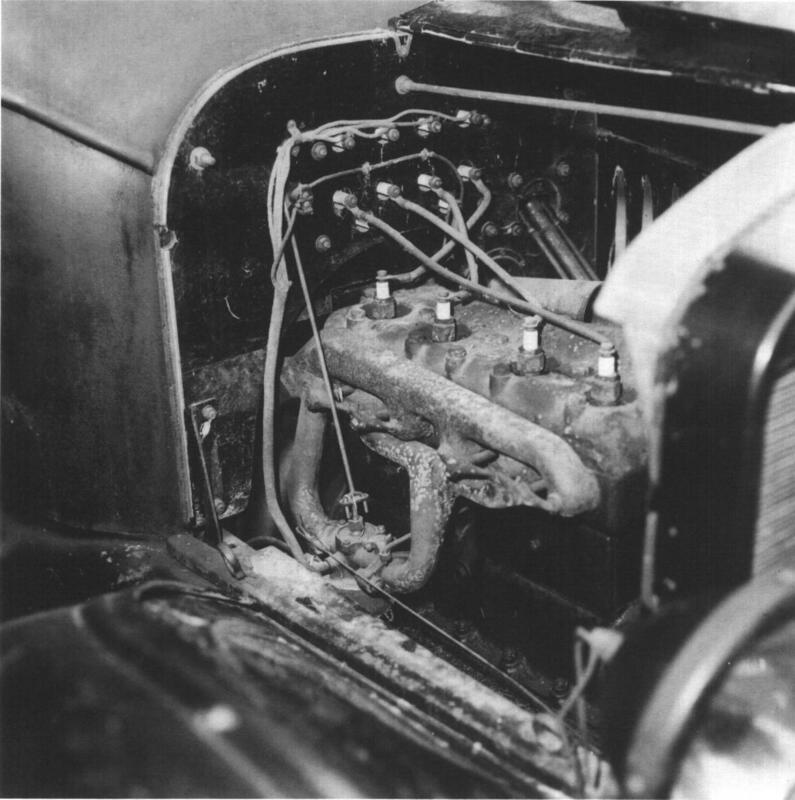 So the newer cars like me early 1922 with starter package and new Ignition Switch mounted on the dash, routed the battery wire to the switch instead and Ford deleted the Battery Terminal coming out of the coil box but left the hole in the firewalls. Adam, There was a previous post in August about firewall build up. According to John Regan, who has done extensive research on all the Ford wood firewalls, there were firewalls made using three equal thickness veneers, with the outer veneer grains running vertical, starting sometime in Oct 1919. So your's must be correct. Are the veneers all the same thickness? I have not really noticed any vertical grained firewalls before I saw yours. Not sure how common they were. 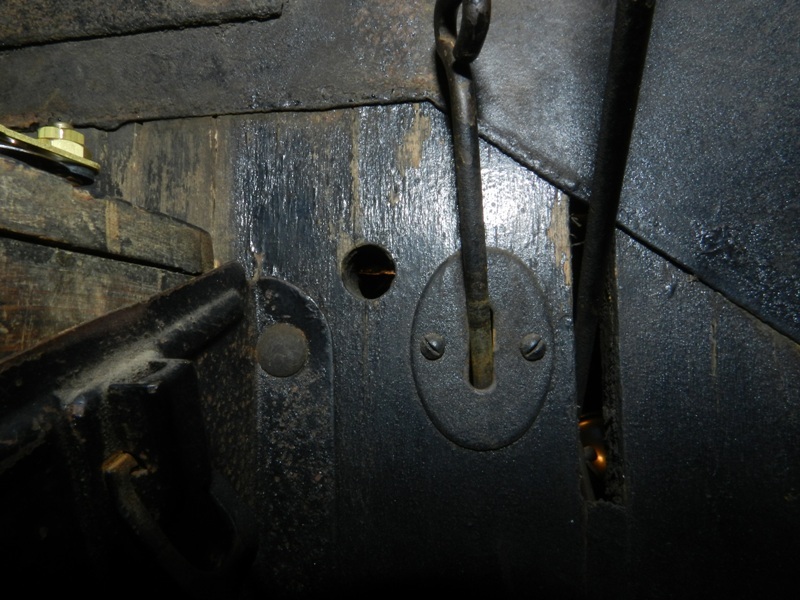 Did anybody notice in Marks wood firewall close up pictures there appears to be some type of metal sleeve or guide in the carb adjustment rod hole that's in the firewall? 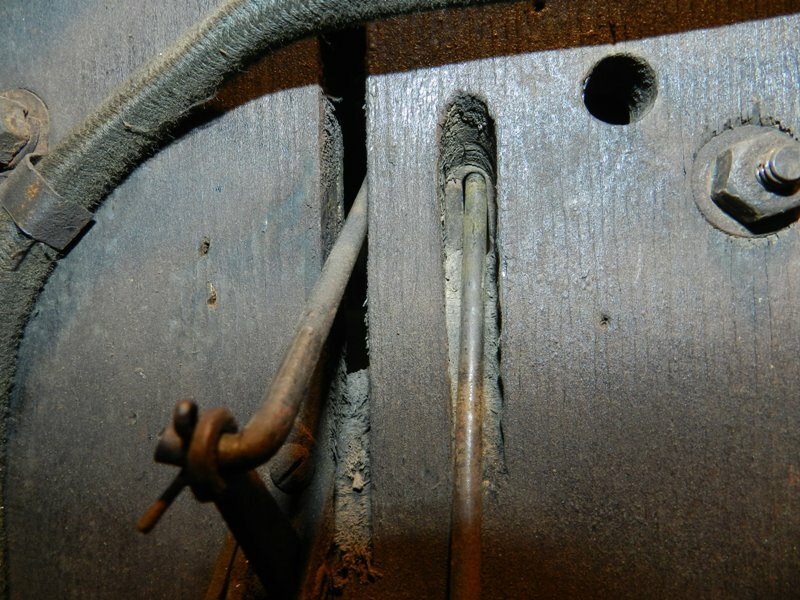 Is it part of the carb adjustment rod for wood firewalls? Was this installed by Ford originally or did someone add it later? I haven't seen that before on other firewalls and that particular part isn't sold by the vendors. Ray: Thanks for all your info on these old Firewalls. I now find myself constantly looking at firewall wood grain. There are a few vertical grain firewalls out there. John: The metal that you are seeing is from the backside. There is an oval metal piece that the rod goes through that is attached from the back. I did not know this either. Its amazing what escapes you if your not looking for it. The trim plate on the drivers side was just the flat plate and I do not recall if there was a guide installed. Adams photos shows it very well. Disregard the two photos, only one added. Looking at my firewall wood layup, it looks like the veneers are about 1/8 inch and the three layers of inner boards are maybe 3/16. The stack up appears to alternate grains from vertical (inside), to horizontal, ending in vertical grain (Outside Engine Compartment). 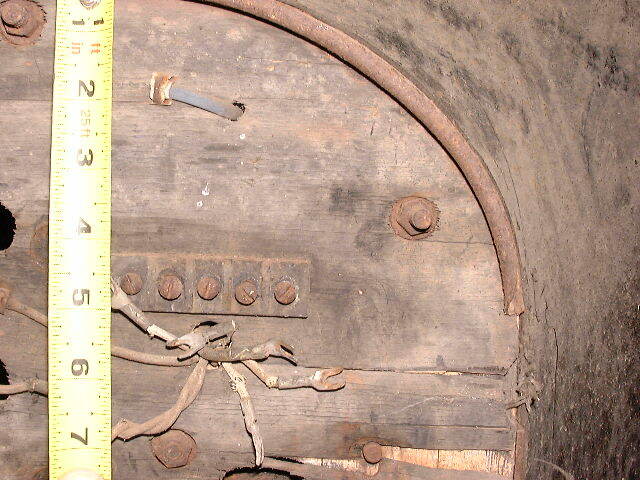 Here is a picture of where the Patent Plate mounts to wood Firewalls. It looks to be four small brads or nails with round heads. I found a post from 2010 where someone was asking but was unable to post this information there. Here are two pictures showing the distance and what they look like. Does anyone have an original Patent Plate in good condition. I know you can get reproduction ones but would like an original if I could. The dash story gets really complicated during the time from the beginning of the 1917 through 1919 version of the dash and one almost needs a score card to keep track of what is going on. THe term panel is used by Ford to refer to the actual paper drawing for a part and that is what I mean too when I use their terminology. To complicate it further, it is often difficult to tell in the Record of Changes (ROC) which version of the dash is being referenced since for a time there were 2 different ways of making the basic wood parts of the dash but both of those versions wore the same part number. 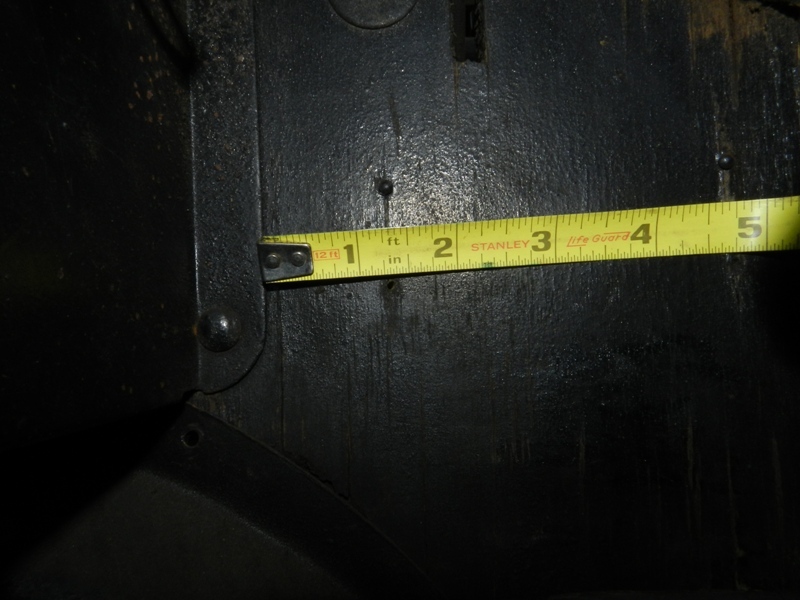 For the record - starting on 3/3/15 the then used 1915/1916 dash changed from 3/4" thickness to 11/16" thickness and that thickness carried through to the new 1917 version of the dash that began its life on 5/2/16. This was what is generally sold as the 1917 and later dash and was changed repeatedly till it was finally replaced by the steel dash in early 1923. Speaking only about the wood portion itself the dash starts its life with a 9/16 core (vertical) and 1/16 face veneers both horizontal. There were changes to hole locations and slots..etc but on 5/7/19 a NEW "4 PIECE DESIGN" for all cars was introduced as experimental but with changes to that experimental design that were not documented they finally agreed to consider this new design as adopted on 5/7/19. I cannot be certain but it would appear that this was not a 4 PLY design but was a 4 piece design with boards then edge glued or jointed in some fashion to make 1 complete dash. BOTH the former method Veneer design and the "4 piece design" used the same hole patterns and details thus they were interchangeable because only the method of making up the wood was different. The 4 piece design specified that the wood was to be white ash or Northern Maple. On 5/16/19 a note was added to the veneer design panel to state it was the veneer design and it would appear that the 4 piece design had its own panel but both of them had the same part number. JFR note here "The stage is set for mass confusion" of future researchers. It would seem that for awhile anyway that there were 2 drawings of the dash both with the same number and only the notes on the actual drawing told you if it was the veneer design or the 4 piece design. On 6/14/19 one or both designs had a notation added "specifying this dash to be dipped in 75% boiled linseed oil instead of 10% turpentine, 15% Japan Dryers. These ingredients to be mixed and applied at a temperature of approx 90 deg F. this change was made to prevent warping and is to be done by the Outside Manufactuers (sic)" JFR note - Ford was constantly fighting warpage but I suspect that the main warpage problem here is the 4 piece design if it is a full 11/16 thick panel of 4 pieces edge glued. No mention which panel or version is being talked about for sure. on 8/19/19 the veneer panel design gets a clearance notch alteration for the hood rod hinges and this is only for ease of machining so not needed I guess for the 4 piece design. On 10/16/19 the 4 piece design panel changed to specify Oak, Mahogany or Sycamore in addition to White ash or Northern Maple. At the same time and date the Veneer design panel specified material to be Oak, Mahogany or Sycamore in addition to Ash or Northern Maple. WE HAVE ALSO ADDED a 3 ply design (ply to be of equal thickness)in addition to the veneer design as now specified. Also added note to the veneer design as now specified. Added note "Grain to run vertical on centerply and horizontal on outer ply". 2 days later on 10/18/19 the 4 piece design was OBSOLETE. JFR NOTE - so now we have a veneer design still as original AND a 3 ply design with outer plys being horizontal but READ ON THERE IS MORE. Just 2 days later the note on the dash was changed from "Grain to run vertical on centerply and horizontal in outer ply" to "Grain to run horizontal in centerply and vertical in outer ply" But for the veneer dash....Also added note referring to veneer design dash "Grain to run vertical on center section and horizontal in veneer. On 12/11/19 Specified the material White Ash, Northern Maple, Oak, Mahogany, or Sycamore to be used only for the 3 ply design and for the core in the veneer design; also specified the veneer to be made out of Maple, Northern maple, or Birch. 5/5/20 Gum wood to be used for both the 3 ply design and the core in the veneer design, also for the veneer in the Veneer design, in addition to various kinds of wood as specified previously.9/2/20 Specified glue to be waterproof. JFR NOTE: Seems kinda late in production to just now be noting the glue needs to be waterproof ha ha. The roof at the dash assembly area must have started to leak. In summary there were a lot more changes that I skipped over that had to do with movement of the terminal block, holes, slots, shape of slots...etc. I tried to focus on what was said about the wood part only but the ROC is very confusing reading since there is no way to be certain which panel is being referenced when there are up to 3 panels being referenced by the same part number. There was the veneer design, 4 piece design, and 3 ply design that for at least a few days all existed at the same time. This was also coupled to the fact that the 1919 era had a ton of changes anyway for the new "electric car" with Starter and lighting system. I would like to reproduce the very early five position terminal block, that has a screw on each end to hold it to the firewall. Each end has a rounded corner. I suppose if I lived near Detroit I could find it at the archives, but I doubt if there would be that much interest in it anyway. John Regan, thanks for all the great info. Do you know why they didn't delete that Battery Terminal Hole (Coming from the Coil Box) in the dash? I think that is what is. Its the hole thats a mirror image to the left of the Mag Terminal coming form the Coil Box as you look from the front of the car.